Posted by V the K at 7:16 pm - November 1, 2016. Just my mindthoughts. I’m just spit-balling here. If you are voting for Hillary… then you are, first of all, utterly oblivious to her corruption, her pathological dishonesty, and her disastrous tenure as Secretary of State under Obama. The Democrat Media Complex has done its job well, reducing all of these to an “email scandal,” which to most LIV’s amounts to, “Hillary accidentally sent some classified documents (whoopsie) to the wrong email address, and now mean old Republicans are picking on her.” Well done, DMC. Bravo. Corruption/lying/incompetence notwithstanding, if you are voting for Hillary, then you are voting for the status quo. And if the status quo means a crooked, lying hag is presiding over a Government that’s approaching Third World levels of corruption, Hillary voters are pretty okay with that. I had friends in Chicago who used to chuckle with amusement at their city’s political corruption; it was cute to them. Many Liberals feel that accepting a corrupt political culture conveys a certain hip cynicism. Not to mention, the corrupt culture of the last eight years has been good to a lot of people; Government bureaucrats enjoying generous salaries, lush benefits, and unchecked power; welfare recipients who’ve seen their benefits expand; crony businessmen who benefit from subsidies and strategic regulation of their competition. To all these, the Obama/Chicago corruption model has been good. And there are a helluva lot of people like that; including the Republican Establishment. Those are the people who are voting for Hillary. Oh, yeah… and “Historic First Woman,” if you believe the position of President of the United States is so inconsequential it’s sufficient to elect a symbol regardless of qualifications. If you are voting for Donald… well, you certainly are aware of the man’s flaws, the DMC has seen to that. They have seen to it that every voter, legal or otherwise, living or dead, knows that Donald Trump is a misogynist, p-ssy-loving buffoon; a character so repugnant even the producers of ‘Mad Men’ would think it was too caricatured. People who are voiting for Donald Trump accept that he is a flawed vessel, but they believe he is the only viable alternative to the status quo. Some look at the corruption in Washington and think only an outsider can drain the swamp. Those who oppose the status quo and aren’t voting for Trump either think he is too flawed a vessel (and there is some virtue-signaling in this as well [‘What would my friends think if I voted for that misogynist, p-ssy-loving buffoon’]) while others think that he’s too much of an alligator himself to actually want to drain the swamp. If you are voting for Gary Johnson, Jill Stein, or Evan McMuffin... well, I think there is usually an amount of virtue signaling in casting a Third Party vote. Because none has a realistic chance of winning, a third party vote is usually a statement that “I’m too good for this election.” Although I also accept that you may vote for a third party candidate because his/her views align more closely to yours than the two party alternatives; especially when each is, to coin a term, “deplorable.” There is also the strategic consideration that if the Libertarian or Green Party candidate break 5% of the votes, they get Federal funding. Which makes sense for the Greens, but is a little funny when it comes to the Libertarians. OK, weigh in. Tell me how I’m wrong. Posted by V the K at 9:15 am - November 1, 2016. This is so very true, and so very sad. This is the Democrat Party. This is also the Republican Party. But this is not what America is supposed to be. Posted by V the K at 7:49 am - November 1, 2016. Oh, Good Lord. Robin Lakoff, a “professor of linguistics” at UC-Berkeley says the only reason Hillary’s illegal use of a private email server, mishandling of classified information, influence peddling via the Clinton Foundation, and lying to the FBI is being investigated is because The Patriarchy is trying to silence a brave and stunning woman. The only reason the whole email flap has legs is because the candidate is female. Can you imagine this happening to a man? Clinton is guilty of SWF (Speaking While Female), and emailgate is just a reminder to us all that she has no business doing what she’s doing and must be punished, for the sake of all decent women everywhere. 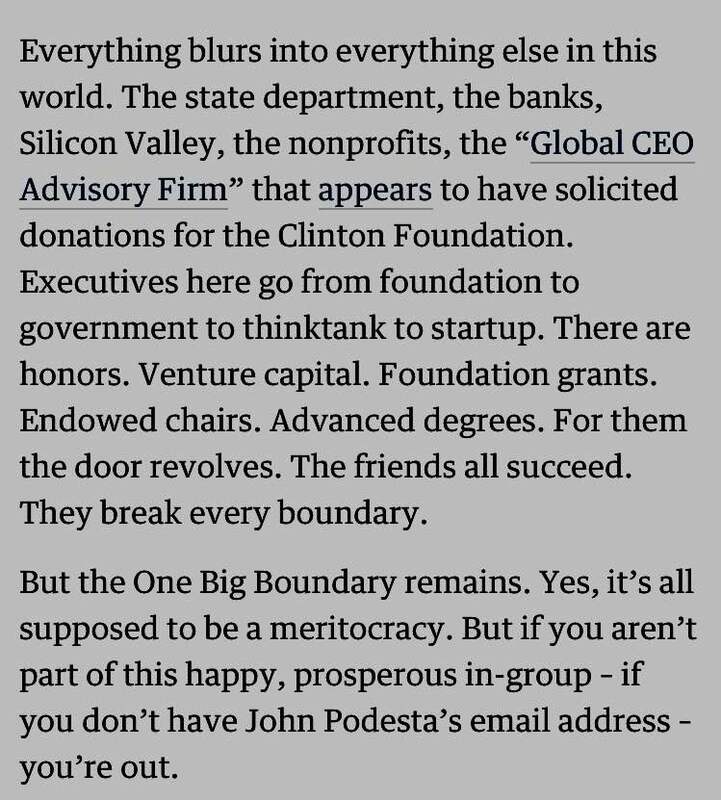 Meanwhile, The Guardian, of all places, is doing what the mainstream American media won’t do (because Democrat-Media Complex) and digging into what Hillary’s emails reveal about our political culture and Governance. Basically, it’s a corrupt, rotten pay-to-play circle of insider politicians, media figures, and billionaire donors all scratching each other’s backs. In one now-famous email chain, for example, the reader can watch current US trade representative Michael Froman, writing from a Citibank email address in 2008, appear to name President Obama’s cabinet even before the great hope-and-change election was decided (incidentally, an important clue to understanding why that greatest of zombie banks was never put out of its misery). And if you vote for Hillary, you are voting for this.